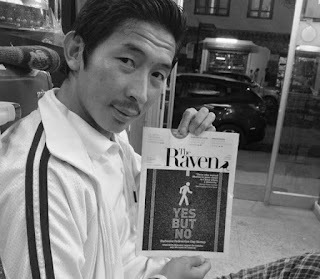 The Raven is the magazine born in difficult times, and I have followed its journey from its licensing time, when the egg was still not hatched. The team behind the magazine, who are very active social activists, and the numerous discussion about it on social media made the waiting very hard. The Raven broke its egg and spread its wings on 13th October 2012; choosing the special day made the occasion of first royal wedding anniversary part of the magazine's history. In next few days I received the PDF copy of the book but that didn't quench the long thirst of having waited. and it was yesterday evening I finally got my hands on the Raven. The magazine is now in Bajothang at TashiKee Mid Point store. Last night I spent the time watching Kezang read it and soon gave up to sleep. This morning I added an extra hour to my day and feasted on the magazine. The name has always impressed me and now the design has won my heart. The Raven's wingspan has covered the hottest issues and its claws have dug the depths. The maturity seen on the cover design is maintained throughout the 74 pages taking its worth beyond Nu.100. The most wow factor was the independence it celebrates with its own in-depth research and interview with people about issues that matter most these days. I have seen magazines come and go, and news of another magazine shouldn't impress me but with The Raven all hopes are renewed and I only hope it will fly down generations across. Best Wishes. P.S: If you are out of the reach of hard copy of The Raven, Send you email address to editor@ravenmag.com or marketing@ravenmag.com I think they are generously distributing the PDF of the inaugural issue for free. 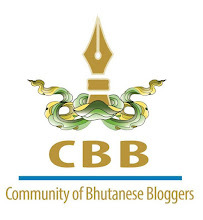 And don't forget to follow @bhutanraven on Twitter. << Since I am getting lots of request for PDF copy of The Raven, and also since I have the permission to distribute the inaugural copy I have created a download link on the left for all of you to freely download the mag. Please acknowledge the free distribution to the two addresses given above. If you could mail me the pdf copy @ rebicks09@gmail.com. M yet to get my hands on the hard copy. The copy is on its way to you Rekha. Enjoy reading it! Every word you have uttered here feels like they have come from my heart. You are indeed a wonderful person, besides being a wonderful blogger. I like that you appreciate what deserves to be appreciated (given that most people only like to talk about the minuses and never bother to mention the pluses). Hats off to you for this post...as well!!! Can you please email me the pdf to pemawangyel20@gmail.com. Your post aroused in me much eagerness to read it. I have already forwarded the PDF to three people, i hope its ok with The Raven since its the inaugural issue.I suggest you to write to editor@ravenmag.com for better service. Thanks for reading my blog! Rightly so Passu. Thank you for limiting distribution of PDF. We are sending out free PDF to those abroad and some in Bhutan not within reach of any sales agents. You can also forward PDF requests to marketing@ravenmag.com. And thank you... you are most kind with your words about The Raven. We couldn't ask for a better review! Kadrinchey La! PaSsu sir or anyone who got the PDF, send one to me please. wai passu me too wanted to quench the thirst of ur raven note and will share about it to my friends. plz share a pdf copy to me. will be grateful to ever. Ok friends, now I have the permission from the editor to distribute the PDF for free since it is the inaugural issue. I cannot be so selfish to enjoy the whole feast myself. But forwarding the PDF is a problem, first I don't have all ur addresses and once sent you don't get it because the mail goes to the junk box by default. Therefore I will provide the link to download the mag straight from my blog. Click on the link to download. My id, kienchuks608@gmail.com..thank Azho Pasu..c u. Thank you Passu sir. I am yet to read and pour my thoughts on it.